She sits in the center of it all, a smiling figure draped in a white saree, god to some, guru to more, mystic to many. A hug from her, some murmured words in Malayalam. The dispenser of the hugs and the words -- and peace, believers say -- is a 49-year-old, crazily busy spiritual leader from Kerala, Mata Amritanandamayi. To her devotees, she is �Amma� or �Ammachi�, which translates to �Mother�. Over the last three decades, Mata Amritanandamayi, born in a fisher village in a remote coastal village in Kerala�s Kollam district, has been accepted as a spiritual/religious guru not just across India but in the West, too. Thus, in 1993, she addressed the Parliament of World Religions in Chicago; in 1995 spoke at the Interfaith Celebrations at the Cathedral of St John the Divine, New York, in honor of the United Nations 50th anniversary. In August 2000, she addressed the Millennium World Peace Summit of Religious and Spiritual Leaders at the UN General Assembly, New York. And in October 2002, she is expected to speak at the UN World Conference of Women�s Religious and Spiritual Leaders in Geneva. Besides spirituality, she is reputed to look after the material welfare of the needy. Through the Mata Amritanandamayi Math, which constructs home for the poor, organizes pension for widows, medical camps, women�s shelter, orphanages, relief funds for calamities, and so on. In person, she comes across as warm and earthy. She speaks only in Malayalam, her dialogue rustic, and refers to herself frequently in the third person. You come across as a happy and optimistic person. Were there occasions when your optimism was questioned? My early life was a big challenge. That was because it depended on the behavior of the people around me. But if you are listening out for an explosion, when the sound comes it will not frighten you. (Laughs.) Amma knows that, and so my optimism has not been shaken. Have there been occasions when you got angry? There is no need to get angry, son. People behave the way they are. If one expects that of them, one need not get angry� Everyone has goodness in them. Even a faulty watch will show the correct time twice a day. I prefer to see that, their goodness, not get angry or criticize their badness. There have never been instances when you were angry? When I see the suffering of people� yes, sometimes, I have felt [that feeling]. I have felt sad too. But that doesn�t help, does it? I realize that. So the next instant that feeling is gone. You have been described variously as god, godly avatar, a religious leader and a spiritual guru. But still? Which would you say is the correct description? Do you see yourself as god, and the people as your devotees? I see them the same way I see my face in the mirror. The same way I see myself. God? Well, I don�t believe in a god who sits across the skies, in heaven. My gods are these people [devotees]. I believe in loving them and serving them. If they see me as god, well, perhaps it could be because that is their vision of god. What is your advise to them? The gist of your teachings? God is compassion and love. Compassion and love -- those are the two things the world needs. There are many people who don�t get love. As for compassion, is there any person in this world who has not sinned? That�s what Christ also said, isn�t it? To me, compassion is forgiving, compassion is giving people even when they don�t deserve. Your embraces have become a sort of trademark now. How, and why did you start it? People used to come and tell Amma their troubles. They would cry and I would wipe their tears. When they fell weeping into my lap, I used to hug them. Then the next person too wanted it� And so the habit picked up. Do you remember when it became a habit? I can�t put a date to it, son. In my youth, I used to move around the villages. I saw much suffering there. There were sick people, people who didn�t have food, old people who were uncared for. I tried to help them, wash them, feed them, comfort them. And pray. The question I faced at that point was whether love was in what I was doing. Whether I should continue it. I was seeing so much suffering, and the question was, should I live this life amidst suffering, should I die amidst it? The answer I got from my prayers is that I was in this world to help them, to do what I can. Here, as I watch you hugging people, I also see them bursting into tears� Could you explain what it is about your embrace that makes people react so? Love is the essence of every human being, son. When it touches them, when the goodness in them is touched, it can overflow -- as tears. Today�s world is becoming more selfish in nature. Everyone wants to get. Not give. Only when you sow can you reap. Without giving, you cannot take. People need to understand that. Embracing symbolizes giving. It�s loving, and love is what there is a shortfall of in the world. Embracing also symbolizes motherhood, the mother from whom you took birth. My embraces are aimed at that, to waken the spirit of giving in people. Amma�s embraces are not a drama, son (laughs). It is not purely physical, but aimed to touch you inside. To what extend do you think your embraces will help the ills of the world? I don�t say I can do it 100 per cent. Attempting to change the world [completely] is like-- pattiyude vaalu kuzhalilittal nuvarumo [can you straighten the curved tail of a dog]? This smile of yours, it is famed among your followers. What makes you smile? That�s the nature of the world, son. Sadness will not get you anywhere in the world. What can an unsmiling face achieve? A wound will not heal with just by the search for medicine, will it? Only if you apply the medicine will it heal. Your biographies list your childhood as having been harrowing, and that you were ill-treated -- do you remember yourself as smiling even then? If you are asking me if I used to smile then, yes, I was, I think. The people around me, they had some notions, beliefs, about how a woman should be. That�s what they have been taught. When they found that I wasn�t like that, they � Yes, I used to smile. When did you realize you had a special gift that would make you stand out? From five years. I used to pray. I realized it, yes. Mata Amritanandamayi is translated as �mother of immortal bliss.� You were born Sudhamani. When did this change of name occur? People gave me that name. They started calling me [that name]. In your biography, there is an incident mentioned when you felt as if there was no difference between you and Lord Krishna. Could you tell us about it? Yes, I did feel that. It was an experience. The way I see my face in the mirror, Krishna�s face seemed to sort of merge with it. It was an intense experience. There is also the belief that you are an avatar of Goddess Durga. That�s what people say. That�s their belief. I don�t worry too much about these things. To Amma, to love and serve is more important. What people say, or think of me, that is theirs to hold. I do not want to worry about it too much. Today them may call me god, tomorrow they may call me the devil. What is your stand on religion? Religion is necessary despite the fact people are only ready to die for it, not live for it. It provides a certain safety, like a fence. But you shouldn�t just stay inside that fence always. That will be like getting into a boat to cross the river and then, once you reach the other end, not getting down. Or like pointing to a fruit on a tree but doing nothing else. Your hunger won�t be appeased by just pointing at it. Only if you climb the tree, pluck the fruit and eat it, you will be satisfied. Same way, religion is only the vehicle. To attain god, you need to act. Does that mean you consider all religion good? Yes. Compassion and love are taught by all religions. Christ said that, didn�t he? He didn�t create Christianity, people created it. Some religions have given rise to fundamentalism. I believe in love. 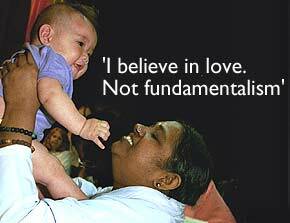 Not fundamentalism. India has quite a few other world famous spiritual leaders -- like, for instance, Satya Saibaba. Have you ever met with them? Amma doesn�t need to do that. Let each person do his own deed. A trend today is that Westerners seem to take to Eastern gurus more than ever. You yourself have a huge following overseas. What do you think is the reason? You must ask them that. [Laughs.] I don�t want to say that they are coming to us because we have better spirituality than in the West. I don�t want say the West is bad and East is good. They have their church here. They have their dharma, we have ours. I don�t way to say ours is better than theirs. That�s another thing. You are reputed to meet people the whole day long into the evenings, managing with just two hours of sleep. What do you do to relax? I am always free. Mind should be free, and mine is always free. And where do you get the energy to go on like this, day after day, month after month, year after year? Mine is a direct connection to electricity, son, not battery. [Laughs]. I don�t depend for light on the candle. I depend on the sun -- and the sun can never stop glowing. There are times when I can only give two or three seconds to a person. When 10 to 40,000 people come. Then I will send them away fast. In an hour, 2,000 to 2,500 people move on. Critics will be there. But they are not there now the way they were when the avatars of gods were born -- like Christ, or Ram or Krishna. So many people were killed before their birth, and so many were killed even when they were living. So, that will always be there. And criticism should be there. The easiest way to destroy a nation is to not criticize the prime minister. Only when criticism comes will the flaws be highlighted. I am not angry with them. There will always be differences of view. In recent years, there have been so many problems in India, and the world. There is nothing new in that. That will keep on happening. One of the world�s biggest trouble spot is in India � Kashmir. You travel to many parts of the world, but haven�t been there yet� Any plans for it? Wherever people call, I try to go. I go wherever I can find time to go. If they call me, yes I will go. If my presence there will bring peace to people, that will be good, I will go.